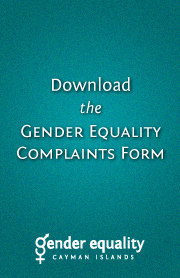 The following national and international bodies also work on issues of gender equality. 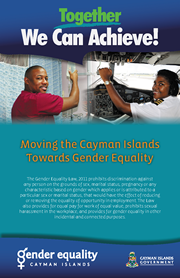 The subject area of gender affairs, including the Gender Affairs Unit and the Gender Equality Tribunal, falls under the Cayman Islands Government Ministry of Education, Employment and Gender Affairs. Check out the Ministry's annual progress report for June 2013 - May 2014, including achievements in Gender Affairs, here. The Family Resource Centre (FRC) is a community-based governmental organisation providing quality, evidence-based programmes to empower individuals and families in the Cayman Islands. Their mission is to be leaders in improving the quality of life for all individuals, families and the wider community. The FRC is one of three branches that make up the Department of Counselling Services and its staff facilitate family and parenting skills programmes, deliver psycho-educational workshops, presentations and trainings, provide crisis intervention and advocacy for victims of family violence, offer anti-bullying programmes to schools and conduct public awareness campaigns to strengthen families and individuals and provide the foundation for a healthy society. Please also check out their Facebook page. The 1999 White Paper Partnership for Progress and Prosperity sets out the UK’s policy on the Overseas Territories. The Overseas Territories Department (OTD), the Governor and the Governor’s Office are responsible for the security and good governance of the Overseas Territories as part of the FCO's global network. 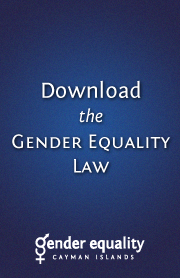 The Government Equalities Office leads on issues relating to women and other equality matters and has responsibility across the UK government for equality strategy and legislation. The Office is now based within the Department of Education. The United Nations Development Programme focuses on gender equality and women’s empowerment not only as human rights, but also because they are a pathway to achieving the Millennium Development Goals and sustainable development. The United Nations Population Fund partners with governments, other agencies and civil society to advance its mission to deliver a world where every pregnancy is wanted, every birth is safe, every young person's potential is fulfilled. UNFPA also focuses on improving the lives of youths and women by advocating for human rights and gender equality and by promoting the understanding of population dynamics.